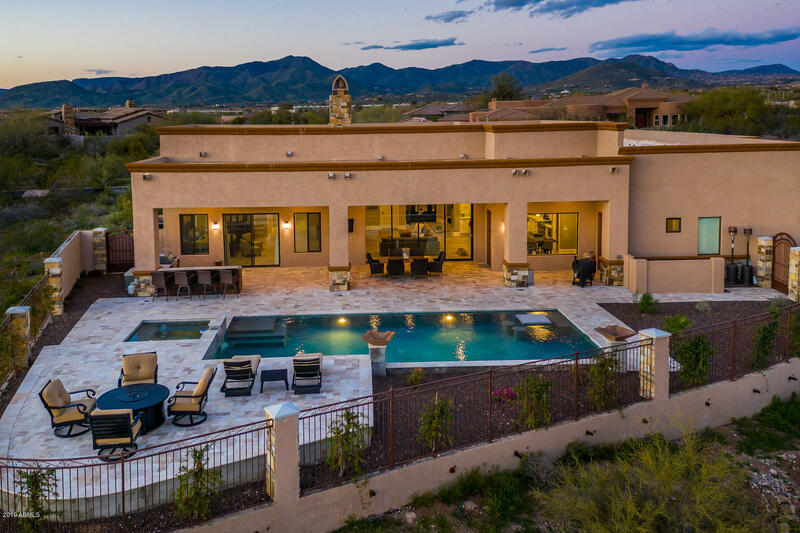 All TECOLOTE homes currently listed for sale in Scottsdale as of 04/23/2019 are shown below. You can change the search criteria at any time by pressing the 'Change Search' button below. "BEAUTIFUL SOUTHWEST DESIGN W/EXCEPTIONAL CRAFTSMANSHIP. FABULOUS GREATRM W/FRPLACE & WET BAR. GOURMET KITCHEN W/WOLF RANGE, SUBZERO REFRIG & FREEZER, WINE FRIG, GRANITE CNTERS, LARGE ISLAND. GRAND MSTR BEDRM & BTH W/HUGE WALK-IN CLOSET. ADDITIONAL BEDRMS EACH W/ENSUITE BTHS. LIGHT STONE FLOORING INT & EXT. FANTASTIC HOME FOR ENTERTAINING. GLASS POCKET DOORS OPENING TO EXPANSIVE COVERED PATIO W/COMMERCIAL GAS HEATERS, LARGE SUNKEN OUTDOOR KITCHEN W/SWIMUP POOL BAR, HEATED POOL & SPA. SPACIOUS ATT"
"Modern Elegance surrounds you in this custom home; finished in 2018. Situated on a mountain (boulder) view lot measuring out at nearly 60,000 sq feet in the prestigious gated community, Tecolote. This home has the space, and tranquility you'd expect in a north Scottsdale luxury home.Built with the entertainer in mind! Great Room opening onto a large patio and outdoor bar & grill along with an amazing pool/spa & raised sitting area to enjoy evening sunsets.All of this can be viewed from the gourm"